The threat of fire is always real, so here’s how you can stop an attic fire. Your attic is one of the most important storage space in your home. While not every home is equipped with an attic, it can be a great way to keep non-seasonal items on hand if you don’t have a storage unit or a big enough basement. But the threat of fire is always real, so here’s how you can stop an attic fire. Make sure all of your smoke detectors work. You’ll want to have one in the kitchen, and one on every floor of your home, particularly in the bedrooms. Walk around your home and test all of them. 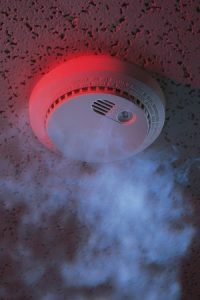 Putting a smoke detector in your attic will also let you know if an attic fire starts. That way you can respond before it gets out of control. Next, be sure to inspect the wiring. Generally speaking, unless you need something, you probably won’t venture up into the attic that often. During your spring cleaning a few months ago, the attic was probably one of the places you went through making sure there was nothing wrong. Still, things can change, especially if your entire house has old wiring that is in desperate need of updating. Spring shouldn’t be the only time you clean your house, and your attic is no exception. Getting rid of cardboard, paper, pieces of wood, and even loose bits of insulation can be tremendously helpful when it comes to reducing the risk of an attic fire starting. As important as it is to keep the inside of your home as fireproof as possible, you will need to do the same for the exterior parts of your house as well. For starters, make sure that there are no tree branches over your roof and attic. If the branches are too long, they can drop pieces of bark and leaves that can dry out and become fuel for a fire sparked by a lightning storm that passes through your neighborhood. An attic fire can spread to the rest of your house, so that means that proper tree care becomes even more important in the summer to keep your attic safe. This entry was posted on Friday, July 20th, 2018 at 2:13 pm. Both comments and pings are currently closed.